AUGUSTA — University of Maine at Augusta President Rebecca Wyke was reappointed to the position Monday. 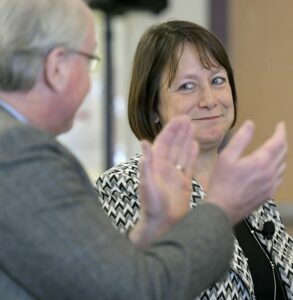 University of Maine System Chancellor James Page, making his final visit to the UMA campus before his retirement, announced the system Board of Trustee’s decision to re-appoint Wyke to the post Monday at an open campus forum in the Fireside Lounge on the Augusta campus. She was given a two-year rolling appointment. Page told the Kennebec Journal Wyke’s direct appointment is only the second time a search has been waived in University system history. Wyke was appointed in June 2017 to replace then-President James Conneely, who had announced his resignation earlier that year. University of Maine System spokesperson Dan Demeritt said Wyke’s tenure has seen increases in student aid and progress made in student access. He said the university’s new spending plan will boost gift aid for students to more than $3.6 million. 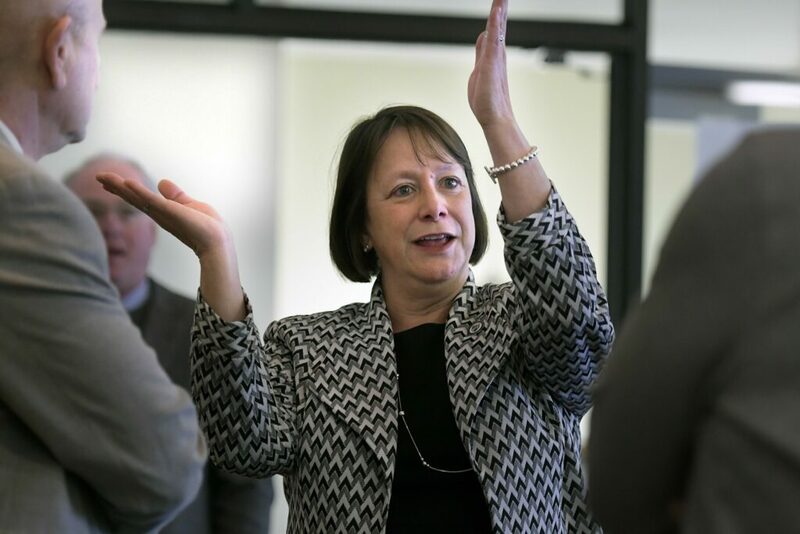 Further, Demeritt said 1,125 students attended the university free of tuition and fee expense this spring through investments in financial aid, adding that 29.5 percent of the university’s students attend for free after grants or scholarships. This year, the university secured nearly $2 million in Title III Grant Aid to expand their programs to more locations. The university provides programs and student support services through 42 locations statewide and online. University Faculty Senate President and associate English professor Gillian Jordan said Wyke’s leadership has helped the university be more accessible and supportive of all student demographics. Faculty were reportedly surveyed, and 93 percent of respondent supported Wyke’s direct hire. “She values our mission, our culture and our students while still strengthening collaborations with our sister institutions,” Jordan said in a prepared statement. The university’s Board of Visitors endorsed Wyke’s direct hire in a March 6 letter to Page. Andrew Silsby, President and Chief Executive Office of Kennebec Savings Bank and Chair of the UMA Board of Visitors, said in a statement that Wyke brought “immediate leadership, vision and stability” to the university. The UMA General Assembly, the recognized governing body of university students, recommended a direct appointment for President Wyke after a discussion with Page. Jacquelyn Estrella, the assembly’s chair, said Wyke values student opinions deeply. Wyke’s two-year term begins on July 1. Demeritt said her salary is fixed at $197,880.